There's nothing out of the usual about the retail package of the HTC Desire 700 dual sim, which does well to tick the necessary boxes without letting the budget get out of hand. There's a standalone A/C adapter, a microUSB cable and a pretty average set of earphones - clearly not the premium variety you get with pricier HTC phones, complete with volume controls. 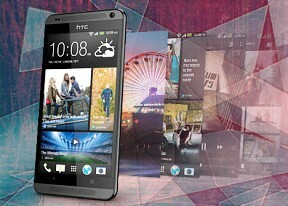 The HTC Desire 700 dual sim is clearly based upon the iconic HTC One design - but the relationship is distant. And we mean no distance too long or too short for the actual price difference. Anyway, although a reasonably good-looking phone, the Desire 700 dual SIM ergonomics could've been better. By providing a bigger 5" screen (over the One's 4.7-incher) and retaining the front-facing stereo speakers, the Desire 700 is even taller. Five-inchers like the Samsung Galaxy S4 and LG G2 are smaller by comparison. Weight is reasonable at 149g - heavier than the aluminum-made One. Thickness isn't all that impressive either, standing at 10.3 mm. Overall the Desire 700 looks alright, never mind the extra coat of gloss. The front is where the Desire 700's resemblance to the flagship is the strongest. The bezel around the 5" screen is reasonably thin and the pair of plastic grilles with BoomSound tech are conveniently placed for watching videos or playing games with the sound meeting you head on, instead of being spilled away. The back is curved, sloping towards the edges of the front. The frame running all around the sides is a soft and darker plastic, drawing a line between the front and the removable battery cover. Nicely curved, the Desire 700 feels nice to handle (a tad too slippery perhaps) but is overall bigger than most people would find comfortable - single-handed use is near impossible. The front-facing camera is placed above the screen next to the speaker. The proximity and ambient light sensors are on the opposite side. The capacitive Back and Home buttons are squeezed between the screen and the bottom speaker. A double tap on the home button will launch the task switcher. The left side of the HTC Desire 700 holds no controls, while the volume keys are traditionally on the right. Another position that's pretty much set in stone on HTC handsets is the power button. The thing is it's nearly impossible to reach single-handedly on a device the size of the Desire 700. We would've reluctantly agreed if it was doubling as an IR blaster like on the One - but that isn't the case here. Next to the power button there's the 3.5 mm headphone jack, while on the bottom we find the microUSB port and the sole microphone (the HTC Desire 700 doesn't have a noise-suppressing mic). The 8MP camera lens and single LED flash are on the back of the device. At the bottom, the rear cover has a small slit to put a fingernail and pull open. The Desire 700 is powered by a 2100mAh battery, and all three slots are accessible without having to remove the battery from its compartment. The primary SIM supports 3G speeds, while the second is stuck on 2G. The microSD card slot lets you expand the phone's storage by up to 64GB. The Desire 700 dual SIM is a reasonably good-looking phone but let down by the details. The top-placed power button is way out of comfortable reach and the glossy finish certainly takes away design points - in a phone that otherwise tried to emulate the flagship. On the other hand, it actually tops the flagship with a removable battery and expandable storage. And yes, it has a bigger screen and an extra SIM slot.